The first national survey of Midlife Development in the U.S. (MIDUS) was conducted in 1995/96 by the MacArthur Foundation Research Network on Successful Midlife Development. The study was conceived by a multidisciplinary team of scholars from fields of psychology, sociology, epidemiology, demography, anthropology, medicine, and health care policy. Their collective aim was to investigate the role of behavioral, psychological, and social factors in accounting for age-related variations in health and well-being in a national sample of Americans. In addition to a national probability sample (N = 3,487), the study included over-samples in select metropolitan areas (N = 757), a sample of siblings (N = 950) of the main respondents, and a national sample of twin pairs (N=1,914). The study was innovative on multiple levels. First, it provided groundbreaking assessment of many psychological factors (e.g., personality traits, well-being, positive and negative affect, sense of control, goal commitments) in a national sample of Americans. MIDUS thus afforded new directions for demography, epidemiology, and sociology via linkage of these psychological factors to key demographic variables (e.g., marital status, family structure, socioeconomic standing, social participation, social support, employment status, health status, health care utilization). Second, the multidisciplinary team carried out painstaking pilot research to develop short-form assessments of many psychosocial constructs. Thus, another first was the creation of condensed assessment inventories that could be used with large population samples. Third, the scientific scope of MIDUS was expansive, covering the wide territories brought to the study by the multidisciplinary investigative team. Once in the field, the study demonstrated that population-level inquiry could successfully encompass unprecedented scope, through a well-crafted phone interview, combined with a lengthy self-administered survey. Fourth, MIDUS included additional studies built around the main sample to provide greater depth in key areas. Diary studies of daily stress were conducted on a subsample of 1,400 respondents (including twins). An over-sample of respondents in the Boston area afforded the opportunity to investigate life management in greater depth. These “studies within a study” provided a novel solution to disciplinary trade-offs between sampling scope and generalizability, on the one hand, and in-depth assessments of core constructs, on the other. The MIDUS design encompassed both. A more detailed look at the scientific objectives of this initial study are described in the first chapter of an edited volume entitled “How Healthy Are We? : A National Study of Well-being at Midlife,” published in 2004. The content of the survey is also summarized in that chapter. 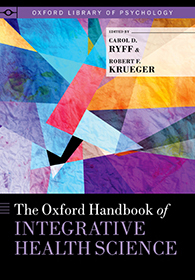 Other chapters in the volume summarize key findings, organized by topic areas. Based on the success of MIDUS 1, the National Institute on Aging awarded a grant to the Institute on Aging at theUniversity of Wisconsin-Madison in 2002-2006 to carry out a longitudinal follow-up of MIDUS respondents. The objectives of this research were to repeat the comprehensive assessments obtained in all of the original content areas, plus launch new areas of biological and neurological assessment. MIDUS 2 thus consisted of 5 separate research projects, each of which collected different information from sample respondents. Details of these projects can be found here. See the Mid-Life in the United States brochure for a more detailed overview of the samples and data content of the MIDUS 1 & 2 studies. The scientific community has become actively engaged with MIDUS. 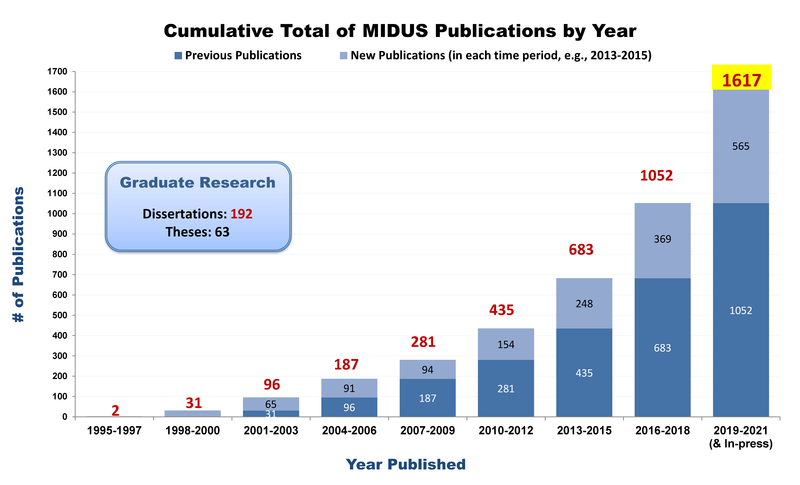 Not only have the number of publications that use MIDUS data continued to increase over the years (they are archived here), publications from the study have appeared in more than 250 scientific journals. MIDUS is also the most frequently downloaded dataset from the National Archive of Data on Aging (NACDA). Based on the quality and use of the MIDUS data, the study was extended for a 3rd round of funding (2011-2016), with the objective of expanding the MIDUS sample, known as the MIDUS Refresher. MIDUS 3 is also included in continuing support from the National Institute on Aging. Both the MIDUS Refresher and MIDUS 3 will substantially augment the current battery of survey measures to include questions specific to the economic recession that began in 2008. This study is designed to allow researchers to examine questions about American’s health and well-being with sensitivity to the changing historical context.